Wine is missing its golden opportunity. It’s got two tickets to the Gun Show and it’s not using them. Fact: there’s more good and great wine made in Australia today than ever before. Fact: wine is the drink of choice with good food and there are more top rating food shows, columns, books and blogs than ever before. We are obsessed with food (though I hope not Conviction Kitchen…God help us). Fact: social media has seen wine chatter levels rise to pitch never seen before. But we’re missing something here. We are preaching to the converted. And the converted are preaching to each other. And everyone is having a grand time. But what about the unconverted and the sort-of-converted? Who’s talking to them? For most wine drinkers (and please try to be really honest with yourself here), wine is a tasty, accessible, sociable liquid, enjoyed in relaxing surrounds with friends. It’s usually refreshing and let’s face it…allows people to “unwind”. They don’t want to talk about wine on Twitter, or read a newspaper column, or pay to go to a tasting. They don’t remember long wine names and it doesn’t worry them. They buy wine for many different reasons or occasions and most don’t want to have a very involved, agonising time deciding. What is the industry doing to make wine easier for them? Not more intellectual or more involved, but simply more welcoming. Apparently the only answer here is to make wine cheaper, have more sales and generally race to the bottom until mutual self-destruction is assured. In real terms, the average price of wine (and cars) has grown very little over the past 20 years, so why do we insist on trying to outdo each other with low prices? Price is important, but it isn’t the only thing. Drawing people into a store with cheap booze isn’t sustainable. Don’t get me wrong…thanks to improved viticulture and winemaking, the grape glut and squished export markets, the quality of this cheap wine is pretty good. But it isn’t sustainable (there’s that word again which everyone uses, and which everyone mentally files to try to challenge manana…manana). A lot of small wineries have already given up on retail, understanding that their wine clubs, mailing lists, cellar doors and increasingly social media marketing are the only ways they will achieve the margins necessary to survive. I’m all for social media, which has created an interactive community where wine lovers, producers, suppliers, writers, sommeliers and enthusiasts interact like never before. And sure it reaches a portion of new or less involved drinkers, but how many really? People are time poor, so are they going to research and engage with the topic via social media if it isn’t one of their primary interests? Probably not. I’m no Facebook expert, but perhaps its mass reach, superficial interactivity and accessibility offers more here. Online peer reviews are the way forward. They already dominate other categories, like travel, so use them! But online still only accounts for a relatively small portion of wine sales. And I suspect that those highly engaged in wine social media are happily serviced by Australia’s high quality (but shrinking) independent retail sector. What I am really trying to get across here is that our wine retailers are failing the average wine drinker i.e. the majority. I’m not talking about the evil corporate side of the argument, but more the engagement side. 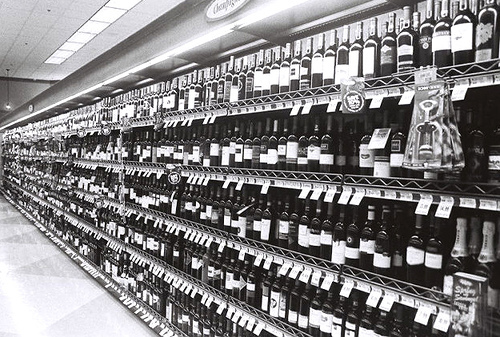 There’s no imagination in our retail wine category, only price wars and endless aisles of hundreds of complicated labels. Back in Boston, USA in 2005 I was so excited when I first walked into Best Cellars, a wine store that brought a small (100 max in about 8 style/taste categories), cheaper (around $15) range of wines to life. It made everyday wine cool and interesting. That’s why I was very sad to read just this week that most of the stores have been bought out and converted to something else. It wasn’t dumbing wine down, it was bringing it to life. Wine education is important…there should always be wine open in a wine shop to try. See how The Sampler has brought interesting wine to life in London with sampling machines. But it isn’t what everyone wants. DON’T expect drinkers to want to learn more, but DO try to engage them and excite them on a wine level that they are comfortable with. This isn’t a nice-to-have, but in a retail future where something has to give, it will be a must-have. This post was originally written for the Wine Communicators of Australia blog. You can find their blog here.